We’d love your help. Let us know what’s wrong with this preview of Journey to the Fringe by Kelli Swofford Nielsen. Long ago, all of Lyria revered the Stone Mages. These magical men and women used powerful tradestones to harness their unique gifts of wind, rain, and earth to help those around them. But war with the Southern realm has threatened the mages with extinction. The truth about the tradestones has been lost,, and the remaining magic is dwindling. When Princess Ivy, the beloved d Long ago, all of Lyria revered the Stone Mages. These magical men and women used powerful tradestones to harness their unique gifts of wind, rain, and earth to help those around them. But war with the Southern realm has threatened the mages with extinction. The truth about the tradestones has been lost,, and the remaining magic is dwindling. To ask other readers questions about Journey to the Fringe, please sign up. Will there be a book 2? I Loved it! I am so excited for the next two. The characters are well developed, I loved each of their individual stories, loved the adventure, the bravery, stories of redemption (not sure if that is the right word for it) with a touch of romance (but not sappy). I want to be suave and cool like Saffi, feminine and brave like Ivy, and powerful like Mara. Well done Kelli Swofford Nielsen. Bring on the next two. I would give 3.5 if I could. It was good, but not great. The story was original, but it felt familiar. The characters were interesting to read about, but not deep enough to feel attached to. I liked it, but wasn’t excited about it. it’s probably best for younger teens. I liked that it was low on angst. And the original world was a good concept. It’s marked as a book #1, but it felt more like a stand alone. Which I actually prefer right now. Maybe other books will just be in the same world? 🤷🏼♀ I would give 3.5 if I could. It was good, but not great. The story was original, but it felt familiar. The characters were interesting to read about, but not deep enough to feel attached to. I liked it, but wasn’t excited about it. it’s probably best for younger teens. It felt like the author tried to cram two books into one short volume. The characters did not have much depth to them. The story line with magic in this reality and how it worked was lacking. I would not get the second volume. On the bright side it is a clean, simple story, maybe some one younger would enjoy it more. It was a fun read. Their magic reminded me a lot of the bending from Last Airbender. The plot was a bit predictable, but it was still well written. It didn't fully grab me and pull me, but it was enough to make me want to keep reading it. good clean book with adventure and problem solving. happy ending. easybread. 3.5 stars. This was a refreshing change of pace. I enjoyed the characters and the world and look forward to reading more about them. This says it's book 1, but I can't find any follow up. I hope so, because this was an awesome read!! It was a decent book and it was fun to read, but the plot was very predictable. 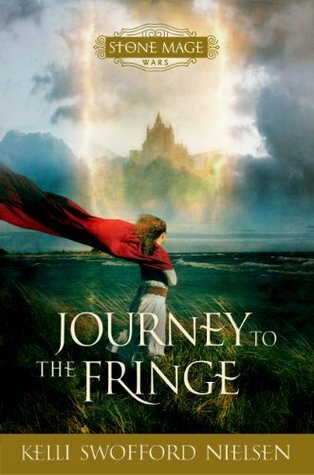 Sometimes it felt like the characters were following archetypes exactly to a T.
On the whole, I enjoyed Journey to the Fringe. The plot was well thought-out, the magic system worked, and the characters were interesting, but I found it somewhat hard to connect to the story. Nielsen uses the third-person omniscient style, but rather than focusing on one or two characters, she introduces many characters. You’ve got Ivy (the kidnapped princess), Simon, Gilda, Burr, Merrick, Hastings/Laith, Medwin, Princess Mara, semi-villain King Than, and the main baddie, Abaddon. Because you’ On the whole, I enjoyed Journey to the Fringe. The plot was well thought-out, the magic system worked, and the characters were interesting, but I found it somewhat hard to connect to the story. Nielsen uses the third-person omniscient style, but rather than focusing on one or two characters, she introduces many characters. You’ve got Ivy (the kidnapped princess), Simon, Gilda, Burr, Merrick, Hastings/Laith, Medwin, Princess Mara, semi-villain King Than, and the main baddie, Abaddon. Because you’ve got all these perspectives, you don’t really graze more than the surface level of each character’s emotions. While this does serve to give the reader a holistic view of the story and events, it also keeps the reader at a distance. Nielsen tells the reader what’s happening, rather than allowing the characters to draw you through the plot and tell you their story. The whole novel read rather like a very detailed outline. The characters themselves were easy to like and I enjoyed each of their perspectives, so it’s tough to say who I’d cut. Each of the characters had different gifts that were later important to advancing the plot. Perhaps rather than cutting characters, I would’ve zoned in on one or two people as the main POVs and used dialogue and plot to bring out the likeability of the others. This could’ve easily been done if Nielsen had zoned in on Simon and had him interact with the other characters. I liked that she didn’t focus too much on Ivy just because she’s the princess and it’s YA, so I wouldn’t want her to be the main POV though I liked her. Hastings/Laith had a very interesting backstory, and the novel would’ve been really interesting if he’d been the main character and somehow got caught up in the rescue-the-princess plotline. Journey to the Fringe is a fantasy with a very interesting world. Though it took me a few chapters to get into the story, after I became acquainted with all of the characters, the story took off for me. A unique aspect of this book is how many different POV's (points of view) are used in this novel. I felt that this allowed more story to be told. If this book had only been told by one point of view, I don't think it would have been as rich and bold. I loved many of the characters such as Prince Journey to the Fringe is a fantasy with a very interesting world. Though it took me a few chapters to get into the story, after I became acquainted with all of the characters, the story took off for me. A unique aspect of this book is how many different POV's (points of view) are used in this novel. I felt that this allowed more story to be told. If this book had only been told by one point of view, I don't think it would have been as rich and bold. I loved many of the characters such as Princess Ivy, Simon, Laith, Captain Merrick, Gilda and of course the old seer Medwin. All of these characters have a gift that makes them a Stone Mage. All of their individual gifts are Earth elementals harnessed to the wind, rain and earth. Princess Ivy can control "space" and open up portal doors and Simon can control the gift of time. I loved the scenes where they used their unique gifts. I'm sorry, but I just could not get into this book. The chapters were SO SHORT. As in ANNOYINGLY short. It wouldn't be so bad if it was all one story, but every chapter switched to a different person's story. So here you are reading about someone's story line, you are just getting into it, and then the chapter ends. And then the next storyline starts up, you read 10 paragraphs (not even enough to get into the story line) and then the chapter ends. It just kept repeating this process over and ove I'm sorry, but I just could not get into this book. The chapters were SO SHORT. As in ANNOYINGLY short. It wouldn't be so bad if it was all one story, but every chapter switched to a different person's story. So here you are reading about someone's story line, you are just getting into it, and then the chapter ends. And then the next storyline starts up, you read 10 paragraphs (not even enough to get into the story line) and then the chapter ends. It just kept repeating this process over and over and over between 4 or 5 characters. I got to page 50 and I was already on chapter 32 (only a slight exaggeration). I just couldn't handle it any more and had to put it down. Also, this author totally spelled everything out for the reader. This is okay in some circumstances, like when it is a new world and you might need to explain certain things, but the author didn't leave anything as a surprise. Rather than let you guess where they were headed, she just told you. Rather than let the girl be surprised when some people came to rescue her, they just told her right away. It drove me nuts. Sad, because it sounded like it could have been a cool story. And I'm sure it was...but I'm not willing to find out in the manner in which it was presented. War is threatening in the kingdom of Lyria, the Southern realm is trying to take over Lyria. Things look especially dark when Princess Ivy, the most beloved to the Lyrians is abducted. None of the Lyrians are sure just what to do, so it takes a while, but eventually a small number of them set out to save her from the Fringe, a far distant and dangerous place for them to go. Our heroes for this adventure are Simon, he's a fool, Gilda, she's a witch who's just had her witches trade stone revoked b War is threatening in the kingdom of Lyria, the Southern realm is trying to take over Lyria. Things look especially dark when Princess Ivy, the most beloved to the Lyrians is abducted. None of the Lyrians are sure just what to do, so it takes a while, but eventually a small number of them set out to save her from the Fringe, a far distant and dangerous place for them to go. Our heroes for this adventure are Simon, he's a fool, Gilda, she's a witch who's just had her witches trade stone revoked because she's never actually done magic, Burr, a small boy who steals away into the ship the heroes are on and Merrick, captain of the vessel they are to sail on. These heroes, along with Princess Ivy will go to far off places, fight the evil with in their midst and most importantly learn valuable lessons about themselves and others, in their quest to get back to Lyria and help in the coming battle before it's too late. This book started out somewhat slow, but still held my interest. The story revolves around several characters who have control of a particular element (I'm using the term used loosely here since "time" isn't exactly an element). However this magic requires a specific gemstone (e.g. Ruby for fire) in order to harness their ability. I found this to be an interesting check on the magic as it allowed for our protagonists to be extra vulnerable when removed from their stones. During one part, for example, it felt a bit (to me) like that part in Chrono Trigger were the player is separated from their gear and need to sneak around and find it. If that reference doesn't make any sense to you then... fine. Ask anyone who writes fantasy what the hardest thing to achieve is and the answer you'll receive will be magical realism. Magic must make sense in order for it to (1) work and (2) be believable. The most base of all magic, and the hardest to write (and get right) is elemental magic; not because it is difficult but because the nature of the elements and the pervasiveness of it in every human culture. Break the rules and it stops working. Twist the rules and you add disbelief. Debut author Kelli S Ask anyone who writes fantasy what the hardest thing to achieve is and the answer you'll receive will be magical realism. Debut author Kelli Swofford Nielsen has produced a well crafted, believable story... and the magic works! This is an amazing first novel! When treachery, war and magic threaten the kingdom of Lyria, an unlikely group of citizen undertake a dangerous journey in hopes of saving their kingdom. Their quest tests their courage, their strength, and their friendship. But it also teaches them much about themselves and the value of standing firm for a common cause. I enjoyed the story line, the character development, and the heroine. If Kelli Swofford Nielsen ever writes another book, count on me to read it. I enjoy many books written for young adults and I thought this was a great first novel. I actually listened to it as we drove across country and I enjoyed the narrator's performance. It started out a bit slow for me. You are introduced to all the key players in the first few chapters but I felt the author did a fine job of setting the scene for the story. Although the overall themes of the book seemed familiar (if you enjoyed Harry Potter, you will enjoy this), I was caught up in the story and fo I enjoy many books written for young adults and I thought this was a great first novel. I actually listened to it as we drove across country and I enjoyed the narrator's performance. It started out a bit slow for me. You are introduced to all the key players in the first few chapters but I felt the author did a fine job of setting the scene for the story. Wow, what is it with me and reading books with rotating perspectives lately? Seriously, I think this the fifth book in a row that employs that writing style. Anywho, although it took a little while to really get going, Journey to the Fringe was a fun, easy read. I loved Burr and Hastings most. This book is the first of a trilogy, but the book concludes strongly enough that it can be read on its own. I would recommend it to young teenagers with a penchant for magic and adventure. I loved this book. I just can't say anything else! This book is completely clean. I don't even recall any swearing! Honestly, books of this quality are so hard to come by anymore. I also enjoyed that the plot was not driven by romance. It was good to have a change of scene. The plot was complex and difficult to explain, but I loved reading it. This Kelli Swofford Nielsen has got herself a new fan. I look forward to the next book! While it may be fun read for a middle schooler, this book quite honestly infuriated me. Aside from some rather annoying characters, there were a lot of comparisons that were extremely confusing, and a bunch of big words speckled throughout the text that didn't match the style of writing whatsoever. But a few redeeming qualities are that it does have a decent plot, as well as a good overarching message. As a first time author Nielsen did an excellent job of creating an entertaining story- Many of the characters and their back story are well developed while others characters are not as clearly defined. The story as well had some parts that were told masterfully while other story lines felt rushed and glazed over. In all I did enjoy this book and found the overall story itself interesting; I look forward to reading the rest of the series. Kelli Swofford Nielsen graduated from Utah State University with a bachelor’s degree in teaching English. She and her husband, Jeff, live in Chicago, Illinois, with their two sons. Journey to the Fringe is Kelli’s debut novel.